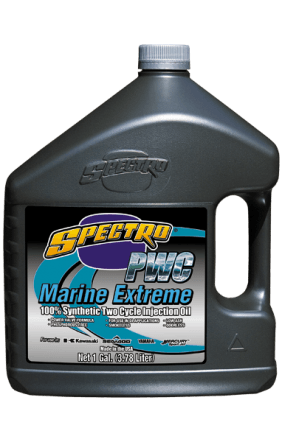 Designed specifically for use in modern two-cycle watercraft, Spectro Marine Extreme Personal Watercraft Lubricant (PWC) is a full synthetic formulation that provides virtually smokeless and residue-free engine operation. Meets all known watercraft manufacturers’ warranty requirements, and exceeds JASO FD, ISO-L-EGD+, and A.P.I. TC test requirements. For use in all two-cycle Arctic-Cat, Polaris, Yamaha, Kawasaki, and Sea-Doo personal watercraft engines — any years, without restrictions! Spectro Marine Extreme Full Synthetic can be mixed at recommended ratios for racing, or used in injector systems.